The cry for well written female-lead comics over the past year has continued to get louder, and Marvel is answering this year. 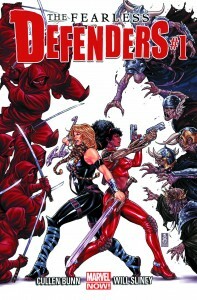 Their latest submission, Fearless Defenders, hits strong and hard. Cullen Bunn is purposefully keeping the focus of issue one narrow with the introduction of Valkyrie and Misty Knight along with an exciting civilian addition in Dr. Annabelle Riggs. The interchange between our two heroes lays great groundwork on the personalities of the Shieldmaiden and martial arts expert with fans who may not be familiar with their storylines. Fighting the bad guys is immediate and intense, the interchanges between the leads playful and exciting, the fun factor kicking high. Dr. Annabelle Riggs is surprising in another fashion. Without magic, special physical training or special weapons to defeat zombie Vikings, Bunn has created an intelligent and powerful character. Online blogs immediately began buzzing with the realizations that this lesbian character had been introduced. Mentioning that does not spoil the story. It’s how it is revealed that is fun and humorous. 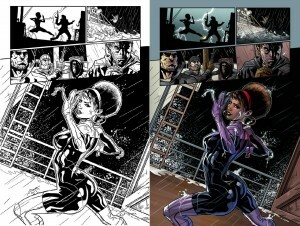 The art of the book is filled with action and purpose, except for the first few panels featuring Misty. Now, the first three or four pages had been released, uncolored for a month or more before the book came out. It was well established that the panels featuring the bionic ninja, Misty Knight, featured plenty of her backside. By the third page, it’s not a big deal. She’s fighting and doing her thing to win. It’s just that first page. There is no fight happening. Misty is simply talking. However, there she is striking what looks to be a potentially back-breaking pose. Now, she was preparing for a fight, so being ready to strike after verbally engaging an enemy is not a bad idea. The only question is, did her stomach have to stick out so far and her back have to curve in so much? Probably not. Veronica Gandini’s color work makes all the difference. Gandini has great use of highlight and shadow that helps the panels to come alive. It also keeps Sliney’s artwork clean and fun to look at, without overanalyzing. What is fun and refreshing about Sliney’s artwork, besides the great zombie Vikings (did I mention there are zombie Vikings!) is his attention to the character faces. Each lead has her own look and personality. Valkyrie, Misty & Annabelle do not all look like the same character with a different paint job. The shape of their heads, tiny details and their mouth are all unique to them, reproduced in multiple panels. That is something that is probably not seen enough in female-heavy comics. Other publishers, with several female characters in one book, can often change the color and style of hair and skin tone and call each woman a different name; however, the face is still the same. In this book, Sliney has given each character her own personality that can been seen on each page, which is just engrossing. A solid foundation has been laid in Marvel’s ramp up in female-lead comics. Bunn has said that each issue after will add another addition to what has been promised to be a rather large team. This slow burn has been used in other series, and should work well to create emotional investment in each new team member. The hope is that any discovery or development with previous characters will not be lost in the new storylines. While Valkyrie and Misty are positioned to be mainstays of the book, Riggs seems to be so enjoyable and I hope that she stays around, is developed at a higher level and not lost in the shuffle. The only way female team books are going to stick around is if people buy and read them. If that is something you like, then you need to read this book. This book should be looked at for its own merit, but it goes without saying that this is almost like a dry run for the all female X-Men in April. If Fearless Defenders continues to have a great mix of character exchange, development and action, I think interest will continue to grow. I don’t see it. Why do the two characters who kiss, kiss? I tried reimaging the scene with Thor and it still didn’t make a bit of sense to me. Surprised the terrible anantomy only took off half a point. Feud is back on! I think this title is not going to be for me. The kiss did bother me, as it seemed completely gratuitous at a time when Marvel (and DC) still struggles to present LGBT leads in a complex way. But honestly, my disinterest is probably more a function of this feeling like just another bland Marvel title to me — characterization a little shallow, art a little generic. It’s not a bad book, so much as it just feels unremarkable. I do want more female-led books, but not enough to keep reading this one (or Journey Into Mystery, which I admittedly disliked more than this). Onwards to X-Men! I fully admit I have a biased take on this. I may hope or see a promise of what is to come perhaps more than the book itself as is. I’d much rather give it too much support now and see how it can develop than have it tank from the beginning and not give it a chance to do something special. That being said, I had a great time reading the book. It openly made me laugh, and want to turn the pages. If that is the feeling it gives me than something must be done right for me. Also, I’m not hung up on anatomy, like SOME! I find programs like Hawkeye Initiative etc. good, however, I’m not going to kill every book or get outraged every time. If Misty was striking that pose while changing in front of a mirror or standing around the dig site, yeah, I’d be upset. But, there is a legitimate reason to be striking that pose when engaging the enemy. It wasn’t the best work of the book. However, lets face it, there are critics out there that say a complete lack of cheesecake is what is killing Captain Marvel. Almost like damning a book no matter which way you go. My comment on anatomy has 0 to do with cheesecake. it has everything to do with “humans do not look like that nor bend that way.” The back kick Misty does at the bottom of page 4 or 5 would require her hip joint to be more similar to an action figure than a human. As for the kiss scene, I am not referring to the pose. I thought “if this scene were with a male character, what would I think of the Doctor?” My answer – the doctor is a weak character who literally throws herself at an attractive person she just met, undercutting any attempt at a complete character. She would be the generic love-awed girlfriend character from time immemorial. Lois Lane jumping off a roof to get Supes’ attention. My reading is then not different given that it is two women in the scene. I do have to give Marvel credit for actually giving a female-led title a new #1 amid the Marvel NOW promotion, unlike the 3 titles before it who either had to take up numbering (and didn’t get much of a sales bump) or debuted in the middle of another gigantic project that took focus. X-Men probably has a better shot with me anyway given my background as an extremely lite Marvel reader. 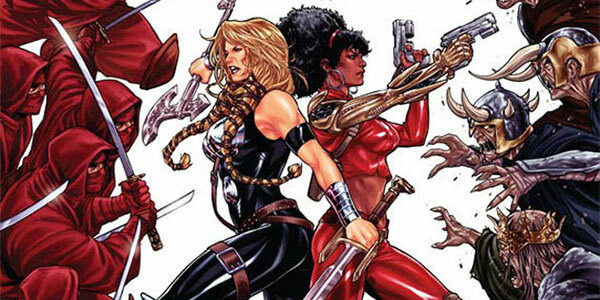 I didn’t have any connection to Valkyrie or Misty Knight before this, so maybe it’s expecting too much for one issue to make up for that. You’re a female archeologist who thought that Valkyries don’t exist in real life. Yet part of you would like one to exist. Suddenly, you’re rescued from certain death by a woman warrior you thought was a myth. What’s more, said warrior is effortlessly holding you in the crook of her very strong arm. And you like girls. What do you think was going to be the next step? On Val’s side, she isn’t exactly running around with a “Property of Flash Thompson” tag on her. Also, the expression on her face during the kiss isn’t that of someone who finds the experience unpleasant.